Time to look at the final Yu-Gi-Oh spinoff manga for now. It was fun to have GX, 5Ds, and Zexal all going at one point. I’ll finally be able to start the Arc V manga soon so that’ll be cool since not having any Yugioh titles for a little while it rough. 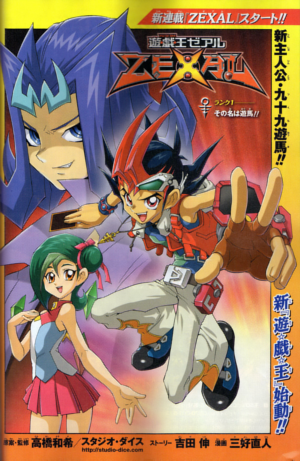 While the Zexal manga was not quite able to defeat the GX or 5Ds anime, it surprisingly had the best manga adaption. It made the risky decision of adding two new characters for the manga, but it actually worked really well as the new characters were excellent. I dare say that this manga just had more stakes and overall epicness than the former. As they were all 9 volumes, this helped clinch it. 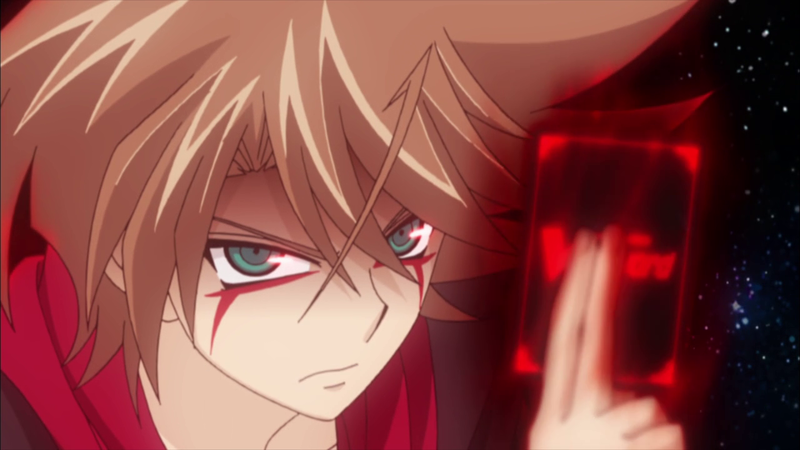 Yuma was not a great duelist, but then he met Astral. Astral was an alien from another planet who had been stripped of his memories and most of his skills. The one thing that he remembers is that he is a master duelist. 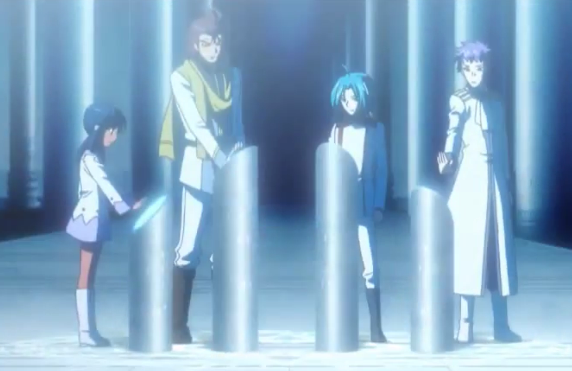 Yuma now needs to collect all of the Number Cards to get Astral’s memories back, but it’ll be difficult since several factions are after it. Yuma’s group is Team 1 and he has several friends helping him out. Team 2 is Shark’s group. The mysterious Luna is helping him gather the cards so he can defeat Kyoji, a guy who has obtained dark powers and may not be fully human anymore. The third group is Team Kite. He needs the Numbers to help bring his brother back from a crazed state and is essentially being blackmailed through that. Finally, we have Kyoji. His motivations are unknown, but he intends to get in everyone’s way. What helps a lot here is that I like virtually all of the main characters. Yuma’s friends aren’t all that great, but they never do all that much and are stuck in the background. Yuma is a fun lead character. He may not be quite as charismatic as Jaden or as serious as Yusei, but he’s a good guy. He gradually gets better at dueling as the series goes on and has to make a lot of tough decisions. He always tries to find a way out for everyone. His Super Saiyan form is also really awesome even if it doesn’t technically do all that much. It does help for the space battles though and the Shining Draw shouldn’t be underestimated. Astral is not nearly as interesting or likable. He typically makes all the wrong decisions and is willing to sacrifice many lives if it will help fulfill his mission. He’s the kind of guy that you really just can’t trust. His dueling skills are exceptional and he is one of the strongest fighters so it is hard to get past him. He probably would be more likable if he had all of his memories, but it would be a very different series if that was the case. Shark is one of the main rivals in the series and he is a lot more reasonable than how he was towards the end of the anime. 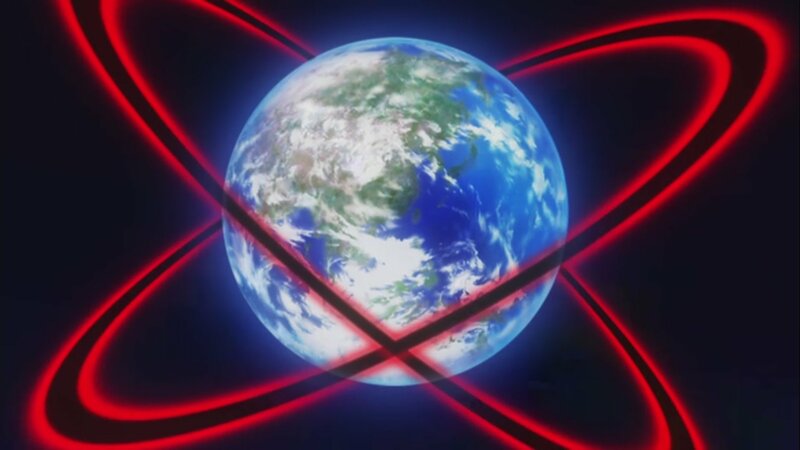 He is actively trying to protect the world here as he fights to stop Kyoji. It’s also rather personal due to them growing up together. Shark’s cards may not be as fancy as Kite’s or Yuma’s, but he gets the job done with pure skills. Luna is essentially his adviser in this series as she helps him become aware of what is happening and even gives him some cards to give Shark a boost. She’s a pretty powerful duelist in her own right and works well as one of the mysterious characters of the series. Luna was necessary to ensure that Shark had at least one ally on his team and to widen the gap between him and Yuma. Kite is always a cool rival and that doesn’t change in the manga. His Galaxy Photon Dragons are always a treat to watch and his “Destroy Them All” deck is my favorite kind. It’s similar to how Kaiba duels which makes sense since you expect the rival to be like that. 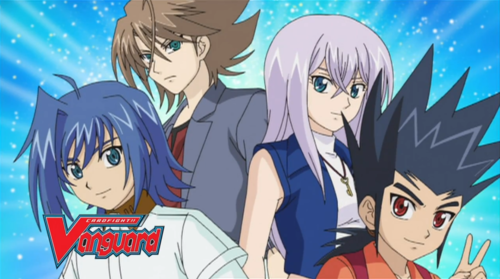 Zexal is similar to GX in that sense as both titles had two rivals. Aster and Zane vs Shark and Kite. Kite is the best rival as Zane was in GX, but they’re both pretty solid. Kite really does a good job of staying tough right up til the very end. Time for the two made up villains of the series. Luna was the third of the 3 Original characters and the author did a really good job of making them all good. 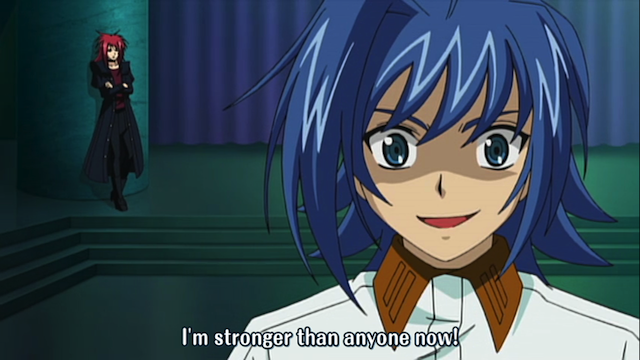 Kyoji has a great design and his spider abilities are very versatile. He has a really good deck and has his own motivations for doing all of this. His backstory is surprisingly dark though and makes a lot of characters look really bad. So, his brother was murdered by a random guy who assumed the brother’s identity and nobody ever realized. Kyoji took care of this guy, but couldn’t really cope with the tragedy as a whole and surrendered to the powers of darkness. He cracked from there. Kyoji was definitely a very imposing villain and while you would be sympathetic enough to root for him, he’s not completely crazy to the point where you wince whenever he’s on screen. He’s pretty cool and works well as the big boss. 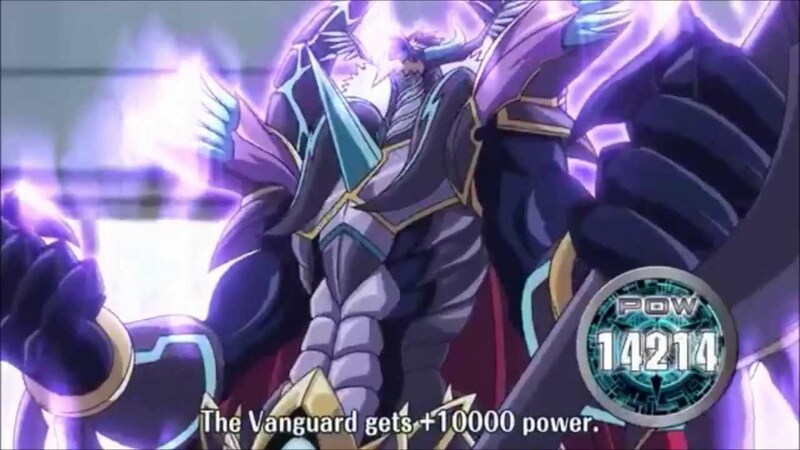 Zexal decided to pull a Naruto and randomly added a cosmic villain of ultimate power by the name of E’Rah. She is the Goddess of Despair and all of her cards as pretty over the top. She’s very powerful and I actually like it when big villains suddenly show up like that. Kaguya, Tabuu, Nightshroud, etc. Unfortunately, it sometimes comes at the expense of a better villain like in this example and Naruto, but I suppose it’s worth the price. The climax just kept on escalating with each chapter. There’s no reason not to like E’Rah as she talks a really good game and has a solid design. She gives off a cosmic vibe throughout the duel. Zexal never stepped on the brakes and just kept on going full speed ahead towards the end. There is constantly a duel going on and I’m not sure if we ever got a chapter without one. I feel like we must have, but at the very least it would have been a very rare occurrence. I am glad that the manga diverged from the anime early on as I always think that the manga titles should be very different. There really isn’t much point in adapting the anime faithfully since you’ll have ideally already seen what is going to happen. All of the Yugioh spinoffs did their own story and it’s worked out well so far. The plot with Kyoji started off right away and that’s when the series really took off. The art was very good for Zexal. I’d say that it was better than GX, but maybe slightly worse than 5Ds. It’s close and I guess you could say they’re about equal. The pages will get quite busy during the duels as some monsters can take up half of the page and with all of the spells and traps being activated left and right, you have to really take a good look at each page to see everything. Not to mention that there is a lot of text on each page so it takes longer than the average volume as a result. This does help give you some more value for your money though right? Overall, Yugioh Zexal was a great way to end off the current Yugioh spinoffs that I was reading. It’s very action packed with a great cast of characters. The duels are a lot of fun as always and they cover a whole lot in the 9 volumes. You’ll certainly never be bored as you’re reading the series and it sets a high bar for all of the other titles. You don’t always need to be a long running series to get a high score as long as you cut to the chase right away. This will also help me get all set for the upcoming Yugioh film and the Arc V manga. Both are bound to be great as Yugioh never disappoints. I recommend reading this manga ASAP and then hurrying off to the theater to help support the Yugioh nation! It’s been a while, but I finally got to go back and complete one of the old Yugioh games that I’ve had on the back burner for a while now. It feels good to finally take it down for the count. It suffers from the usual problem that Yugioh games have on the home console and that’s the long loading times. 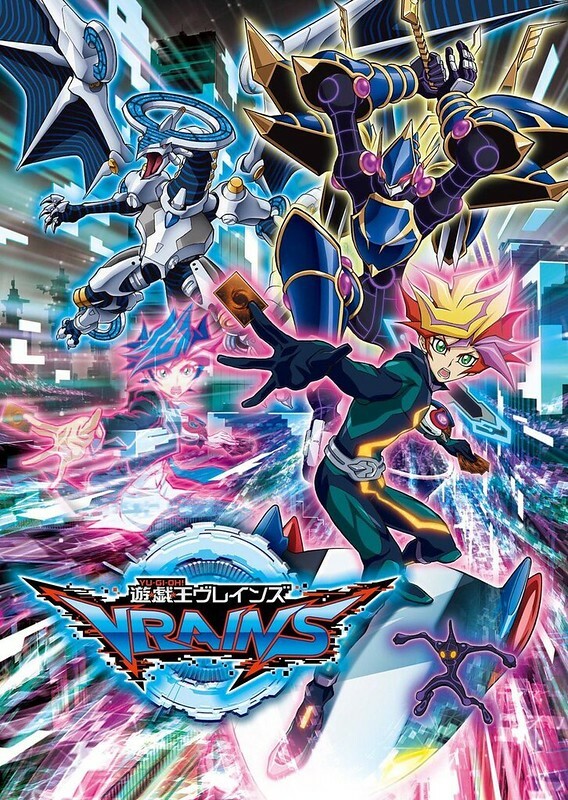 Still, that’s really the only main problem for the title as it still does a good job of capturing the Yugioh enjoyment that I’ve come to expect from the series. It’s long and it’s difficult, but the game can also be very satisfying. After all, what’s more fun than having a quick round of Yugioh? This title also does have a plot which is something that you can’t really say for many of the other Yugioh games. Where this takes place in the anime is a little vague, but all that you really need to know is that many of the world’s greatest duelists have been trapped inside of a large tower. The only way to get out is to duel everyone and prove yourself to be the strongest. The problem is that there are no pushovers here and some of the villains may decide not to play by the rules. You control an original character who has arrived at this tower. He may not have a rep yet, but he is actually the greatest duelist of all time. Not too shabby eh? Can Terry (That’s what I called him) save the world or is he doomed? Time to find out! We may as well go over the technical aspects of the game first. The graphics look fairly good here. Everyone is a little pixelated, but in retrospect, a lot of the Wii games had similar issues with the character designs. It still looks rather well considering. I also liked the designs for the new characters. They stood out and were original. Odin had a cool armor and his true identity was also pretty intense. That definitely worked well for the final boss. As for the soundtrack, it is fairly solid. A theme will come up if you are close to winning and likewise if you are close to losing. There are quite a number of good tunes here although the soundtrack definitely could have been larger. It’s mostly all fast paced and fits well for the duels. Time to quickly explain the gameplay system in case you have never had a duel before. Each player starts with 5 cards and then you draw another one each turn. You summon monsters to the field (1 per turn although you can special summon others) and use them to attack your opponent’s life points. Spell and Trap cards are also allowed into the mix of course. The first person to land at 0 life points loses the round. The concept is simple enough, but there are many rules and complexities surrounding this so you’ll still have a lot to take in when you first boot up the game. I recommend working on building your first deck to start things off. Choose each card yourself so you know exactly what they do and when to activate each card. I recommend holding down the B button during the turns if you know that you won’t be using a Trap Card. Otherwise, it will ask you this question throughout every phase of the turn, which can slow the game down considerably. I ended up going with a deck that was heavy on trap cards and anti trap cards. My deck was a little larger than most people would recommend it be, but this served me well twice. There is one character in the game who has an incredible defensive strategy. Her name is Luna and she won’t hesitate to time you out. Our duel went into the 80s I believe, but luckily my deck was a lot larger than hers so that ended up earning me the win. She tried the same tactic later on and I used the same counter. Don’t underestimate trap cards. They are extremely valuable in this game. You will need to really enjoy the duels to get any fun out of this title. That’s because the game is over 20 hours long and that equals a lot of duels. There are roughly 13-15 levels in the game, but each one has up to 5 duels and sometimes even more. You also shouldn’t expect to coast by either as these guys tend to put up quite the fight. Many of them took me several tries to defeat, but naturally none of them could ultimately stop me from reaching the goal. Ironically, the second last boss is probably the easiest in the game. I happened to get a really good hand, but even considering that, a perfect 8000-0 battle is pretty rare. As for replay value, there is a lot of that. After beating the game, you will unlock a few more levels where you can fight opponents with incredibly strong decks and get more cards. There are hundreds, if not thousands of cards in this game so collecting them all will be a very tough thing to do. That is sure to buy you a lot of time. One thing that I don’t like is that you can’t use some of the cards that you obtain because they are deemed illegal. If that’s the case, why put them in the game at all? Even if the computers keep on using them anyway, we shouldn’t be able to buy those cards if they are just going to sit around. The gameplay’s a lot of fun as you can tell, but the game did have one thing holding it back. The long loading times. I can’t stress this enough. If a game takes a while to get through each duel, then the adventure will start to feel a little too much like a grind by the end. For some reason, this always happens to the home console version of these titles. The DS World Championships and the PSP Tag Force games are always lightning fast and I dare say that they are more intuitive. After all, in those games, you could activate magic cards whenever you want. Now, you have to wait until it’s your turn. Overall, It feels good to have finally completed Duel Transer. That game was certainly on the backburner for a long time so this is a big moment. Next up, I aim to take down the Yugioh game for the Gamecube. The plot is definitely very odd (and boring) and the game is even slower paced than this one. Ah well, we’re just going to have to wait a while before we get a really fast title I suppose. At the very least, this just goes to show how popular Yugioh is. It’ll always have more games to play. 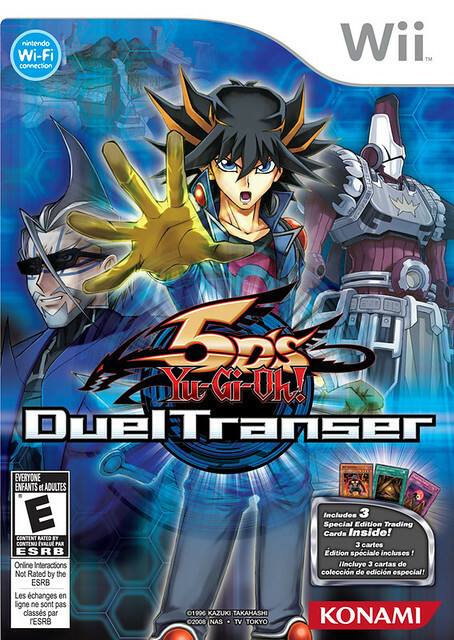 If you’re a big fan of Yugioh, then I definitely recommend this game quite a lot. You may never get to Synchro Summon since the rules seem more complex than usual, but at least you’ll get to fight many powerful foes. 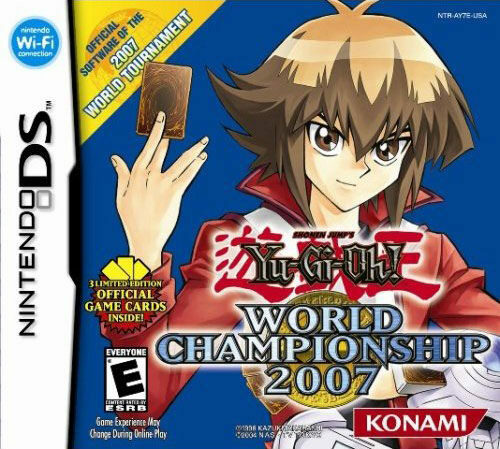 If you’ve never played Yugioh before, then you may want to start with World Championship instead as it does a good job of easing you into the challenge.